Signalling for live steam ride on trains has always been desirable, but it sometimes difficult to reproduce the system used on full size railways. This is partly due to the fact that many model railways use fully welded track (where the 'sleepers' are welded to the rails and short circuit across the rails, preventing full track circuiting. The ideal solution is continuous track circuiting, similar to the prototype. The other pre-requisite is to detect the trains automatically, using a block occpancy detector. The best way for any detection circuit is to use an electric current, which is switched either on or off by the train. 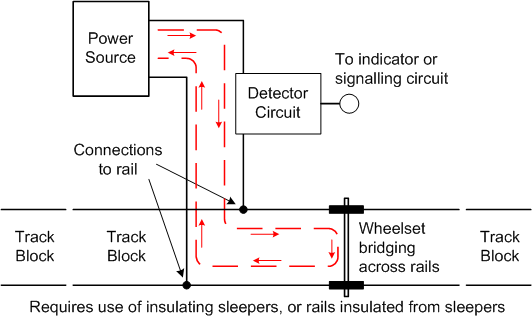 This applies whether the rail is fully track circuited, or just a short detector rail is used. It is best to use the KISS principle (Keep It Simple, Stupid!) and have a simple yet reliable design. Other methods have been proposed, and some used with varying degrees of success, such as RFID tags, photo cells or similar, spring elements operated by the passing wheels etc. However, all of these have shortcomings - they either don't work reliably, are quite complicated requiring expert knowledge, very expensive, or just plain don't work well enough to use in this application. How does it work? 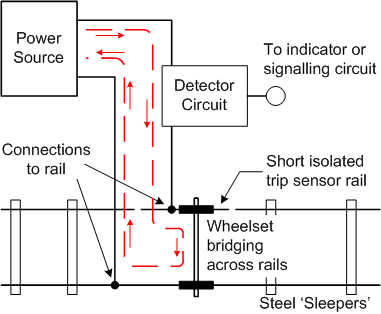 A current from the power source (shown as a dotted red line in the figures) flows through the detector, then across the rails via a wheel set(s) on the train before returning to the power source. The detector sets and limits the current through the rails, and provides an output when a train is detected. Figure 1 shows the configuration for full track circuiting in a block, and Figure 2 shows the configuration for a short trip rail. The basic circuit itself is the same, just the configuration is different. It should be noted that this circuit is a detector which is intended to just detect if a train is present, it is not a signalling system - this is another whole topic in itself beyond the scope of this article. It is just one component of a signalling system. The detector's function is simple:- When a train is present, provide an output signal, nothing more, nothing less. What voltages and currents? Small voltages and low currents, while they may save power, are prone to false readings, particularly when wet, or when used in a variety of situations and climatic and soil conditions. A reasonably large voltage is required to overcome any rust or other contaminants which may be present on the rails, and better handle any voltage drop in long cables, in general the higher the better. However it is best to limit the voltage to less than 50V to satisfy safety and regulatory requirements and to be classed as "Low Voltage". Commonly available voltages are 12V, 24V or 32V, and these can be used. Detectors can be made which detect hundredths or thousandths of amps, and are very (too) sensitive. 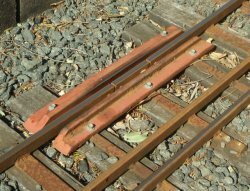 These low currents are not suitable, as there is always some leakage current across the rails or sensor rail due to a coating of 'crud', or dust or moisture or a combination all. There may (will) be sufficient leakage to trip the detector and give a false detection. A reasonably substantial current is required to differentiate between leakage, however caused, and a genuine train (with a quite low resistance wheel set bridging the rails. If a current of larger than say 50mA (milliamps) is used, reliable detection can be achieved. Either AC or DC current may be used, and for many situations either would be satisfactory. However, the DC over extended periods of time may set up a corrosion cell which eats away at the rails, or the connections or both, over time. The use of AC is better and helps prevent any electrolysis. This also mirrors full size practice which use AC current signalling circuits. The output of the detector is a general-purpose contact closure type signal, which in turn if fed to an indicator, or signalling circuit. It is up that circuit to decide what action to take in response to a train being detected. A voltage of 24V AC, and a detection current of 80mA to 120mA meets the goals of reliable detection with no false alarms, even when the track is underwater. A readily available and suitable detector device is a relay, and provides an electrically isolated contact output. Modern reed relays are extremely reliable, small and cheap. They typically operate at around 3~5V, so some circuitry is required to scale the operating conditions. Power source may be AC (preferred) or DC. Bridge rectifier: General purpose, 100V, 1A rating or greater. Note that the relay output contacts are rated at about 500mA, not enough to drive many lamps directly. A lamp driver relay may be required, and any signal processing circuitry must be able to accept a contact closure input. 105 Text and photos Copyright © 2006-2019 SMEX, All rights reserved.